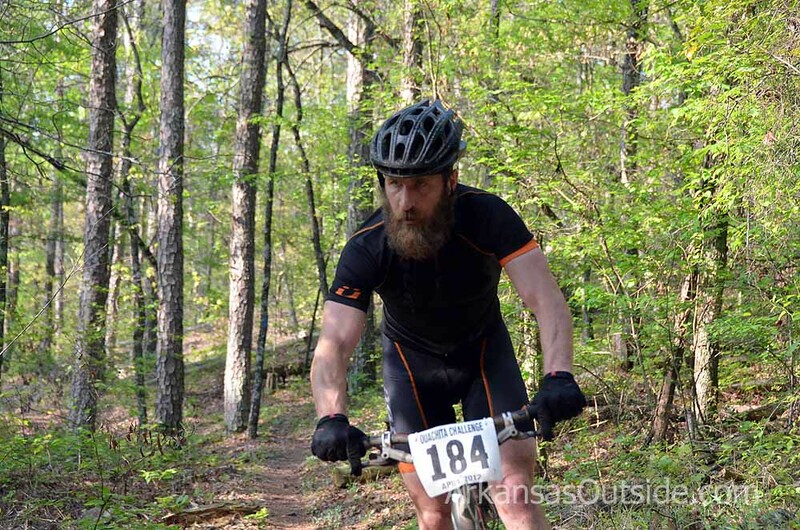 Last weekend was the 12th running of the Ouachita Challenge in small Oden Arkansas. I've done the race the last 2 years, and it's one of the hardest endurance mountain bike races in the midwest. 60 miles of gravel, road, huge rocks and some of the sweetest bench-cut single-track I've ever ridden. I came into the race this year unsure how it would go. I've had some success there in the past with 9th and 6th place finishes, but so far my results this spring have been mixed. Add in the hottest temperature for me this year and who knew what would happen. I stayed with the family in an awesome secluded cabin about an hour from the race HQ. I try to turn my "bigger" races into mini-vacations since I don't really go on vacation. Luckily I have an understanding and supportive family. I was able to pre-ride Big Brushy (the first trail section of the race) on Saturday, and the trail was in great shape and I felt pretty good so I hoped Sunday would go well. My strategy going in was similar to last year; try to hit the trail near the front, survive the rocky first half of the race, have someone to work with on the road between the Ouachita Trail and the Womble, and make my race on the Womble. I've said it before; I'm not a good technical rider. I'm sketchy in the rocks and not fast on the downhills, but I can climb relatively well and have good endurance. I have to play to my strengths and the first half of OC just emphasizes my weaknesses. Make it to the Womble would be my mantra. My Kuat teammate Cale McAninch was doing the race, and lucky him, he got to sleep in the Kuat van instead of a cabin (that's me posing, not Cale). I really hoped we could ride together until the road section in the middle of the race since he's a strong road rider, in addition to a great mountain biker. It was his first OC and chances of us riding the same pace for 20+ miles were slim, but that's what I was shooting for. The race starts with about 8 miles of pavement/gravel to the Big Brushy section of the Ouachita Trail. Last year it was pretty mellow. This year was not. I ride a 1X10 and was spinning as fast as I could on the flats and could barely hang onto the back of the lead group. I don't know what the deal was, but people were in a hurry to get to the trail. There's a long climb right before the trail, and as I made my way up it looked like there were about 20 people in front of me. I passed a few people and found Cale on the way up. I jumped on his wheel and rode with him to the top. Then, right before entering the trail he passed 2 people and they got between us. So much for riding with Cale. In a few minutes he's gone and I'm doing my best to avoid rocks and keep from wrecking. I got passed by a few people on Bushy, passed a few others and popped out to my support crew after about an hour feeling pretty good. Blowout mountain, the next trail section was the hardest of the day. I start that trail feeling pretty confident about myself and my riding ability, but by the time it's over I feel like I'm not a "real" mountain biker and I'm unclipping at the first sign of a rock garden. The shear size and number of them just beat me into submission. But I survived it, refueled at the aid station and started making my way up Chalybeate Mountain. The climbing is what defines this section for me, and while I was making up some time from all my hike-a-bike on Blowout, I also had my only mechanical issue of the day. The zip tie that holds my derailleur cable to my frame near the rear derailleur broke which let the cable flap around, snagging on my shoe as I pedaled. I fixed it by using one of the twisty ties from my number plate, but it kept coming undone and I had to stop several times to re-do it. Frustrating, but of all the things that could go wrong, it was pretty minor. Check out the sweet new Kuat Kit's. Coming soon to a store (or website) near you! As I was fiddling with my bike I was jockeying back and forth with Corey Godfrey, a guy that I've ridden with at some point during my 2 previous OC's. When we popped out on the gravel road for an 8 mile ride to the Womble I told him I'd like to work together so we could make good time on the road. I told him I didn't think he would get much benefit drafting off me since he's at least 6'6" and I'm at most 5'7", and he said; "gravel's my thing". So I jumped on his tail and he proceeded to pull me to Sims, where I got a bottle hand-up, waited for me to catch back on, then pulled me to the Highway 298 aid station. Along the way we caught another rider who was happy to have a draft. I can't say enough how awesome it was to have Corey to draft off of from the OT to the Womble. We were flying and I was recovering the entire time. As we approached the Womble trail Corey said to go on because he was starting to cramp, so I took off, feeling as good as I'd felt all day. I was sitting around 16th place but soon started catching riders who were having issues with the heat. About 5 miles into the Womble I caught up to Brandon Melott and Cale. Brandon was on a single-speed. Cale was cramping and having heat-stroke symptoms so after riding with Brandon and I for awhile, he pulled over and told us to go on. Brandon was riding well and it was good to ride with him, but when he pulled over at a road crossing to re-fuel I went on. I wound up catching a couple more people, then as I was coming off the Womble for the ride back to Oden I caught up to Andy Gibbs, a St. Louis rider I've raced against many times. It was his first OC and he'd burned a few too many matches early on and was running on fumes. I would have been content to finish the race with him, but on the last gravel climb of the day, he said he was blown and I went on by myself. I wanted to finish in under 5 hours so I put my head down and rode hard to the finish. I ended up crossing the line at 5:01:52 in 8th place. Much better than I expected for most of the day, so I'm pretty happy with the result. Here's a link to my garmin data for the day, and here's a link to the official results. There are TONS of photos out there from the day, so if you're interested, look here, here and here. The weekend was awesome, and the race, as always, delivered. I may never crack that top 5 but I'll keep coming back and trying. Big thanks to the friendly/helpful volunteers at the aid stations and road crossings, and of course to my support crew for keeping me moving.